Dural Irrigation engaged Quantum to design a new website/ecommerce solution. 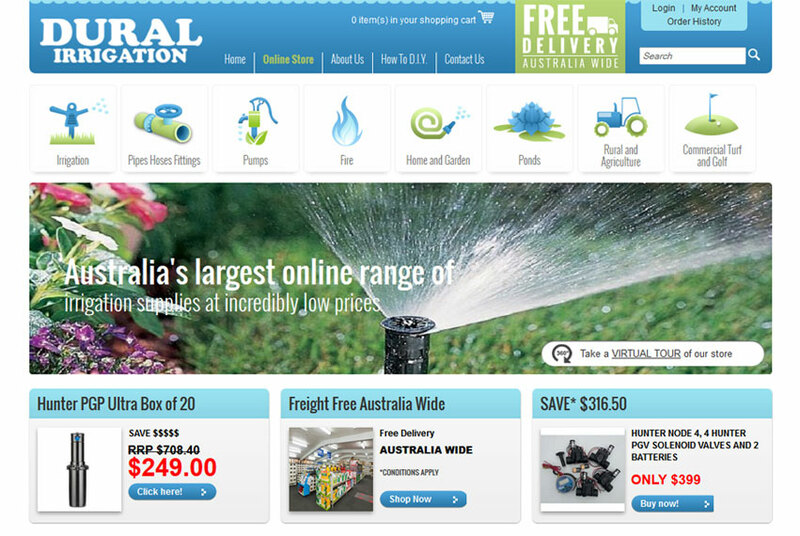 Dural Irrigation provide the largest online range of irrigation supplies. Their existing website was quite old, and was no longer an effective online selling tool. Dural Irrigation wanted to improve the online shopping experience for their customers, while linking the website back to their Point of Sale systems to keep the customer and inventory data between the two systems always up-to-date. The existing website was unable to integrate with Google Analytics ecommerce tracking function, and so their Google AdWords specialist was missing considerable opportunities to optimally improve the campaigns performance. Quantum broke the project down into Design, Functionality, Usability and analysed the customers online shopping journey through the website to make the experience as simply as possible. At completion of this project the Dural Irrigation website had a clean beautiful design that matched their target market, as well as increasing sales, both through making the online sales experience easier, as well as providing better Analytics data for improving Google AdWords performance.